Saturday, 08 Jun 2019 at 12:00 PM . Award-winning dance music festival Junction 2 returns for 2019, expanding across 2 consecutive days of music at Boston Manor Park on Friday 7th and Saturday 8th June 2019. The newly added Friday will showcase a more diverse spectrum of sounds, with the scenes most reputed selectors, weaving a cohesive collage of styles. A veritable smorgasbord of electronic music. 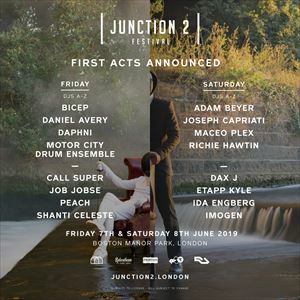 Saturday at Junction 2 will continue to be rooted in techno, with some of the industry's most influential figures flying in from across the globe to bring dancefloor-pounding sessions to the UK's most in-demand festival. Junction 2 will be sticking to their ethos of 'less is more'. This is reflected in their dedication to extended set times - giving artists free-reign to craft a musical journey with a start, middle and end. In addition, their promise to deliver exceptional sound quality, dispense with the traditional "big top" format and strictly no VIP, all remain to be true. Operationally, they are honing the work of the past 3 years; a festival that genuinely places the customer experience at its heart. Hosted at Boston Manor Park, Junction 2 is an underground electronic music festival organised by LWE. It merges natural beauty, green fields, rambling rivers, woodland pathways and hidden enclaves - all dominated by striking industrial features that make the site iconic. LWE's attention to detail is obvious across the site, with operational excellence and exceptional sound. Created by LWE, 2019 will mark the fourth edition of the festival.